For OSX 10.13.2 (17C88) I needed "WebDriver-378.10.10.10.25.102.pkg" & "NVDAEGPUSupport-v4.pkg"
Follow the steps in "Installation steps OSX" above with the files required for your new OS version. Keeping the eGPU plugged into the MBP upon boot results in a black screen and no boot chime in both Windows 10 (bootcamp) and Mac OS X. Having to manually shutdown the MBP and reboot with everything unplugged each time. It’s a minor hassle to use these 3 steps, but seems to work reliably which is a current win. 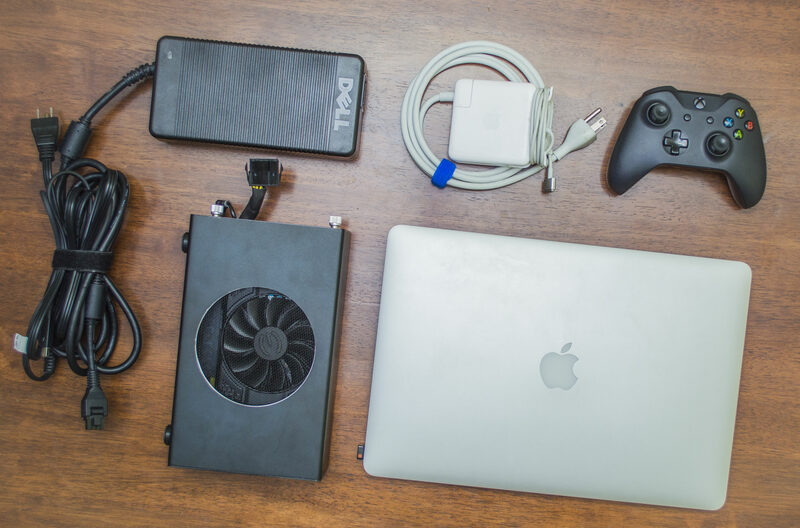 With MBP shutdown, plug your eGPU into power supply and an external monitor but keep it unplugged from the MBP. 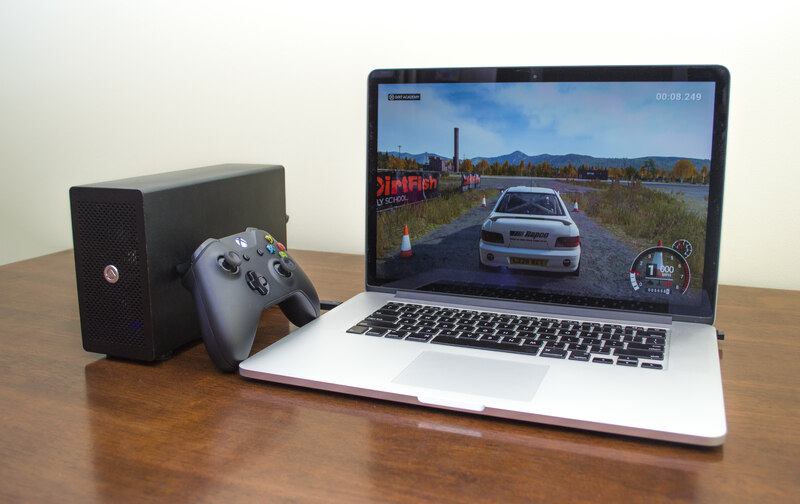 Select your OS of choice, press enter and plug the eGPU into the MBP, quickly. 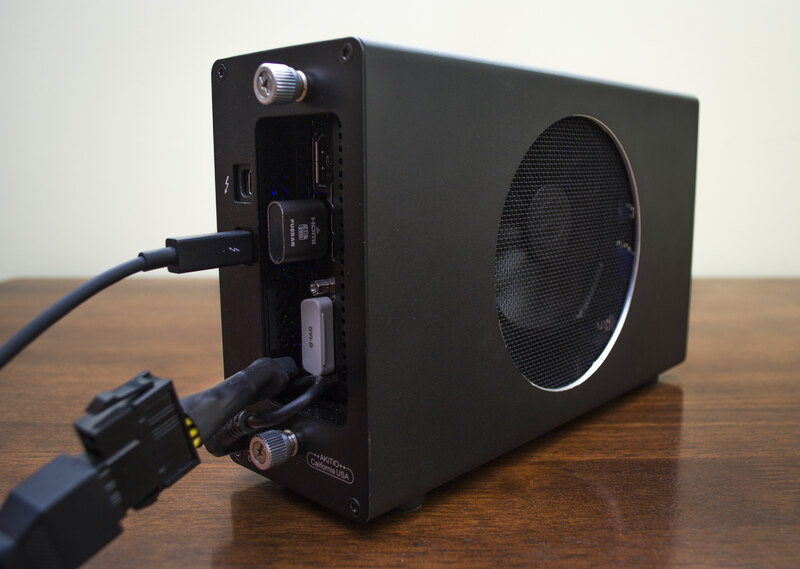 If Windows booted without the eGPU, reboot Windows with everything plugged in. 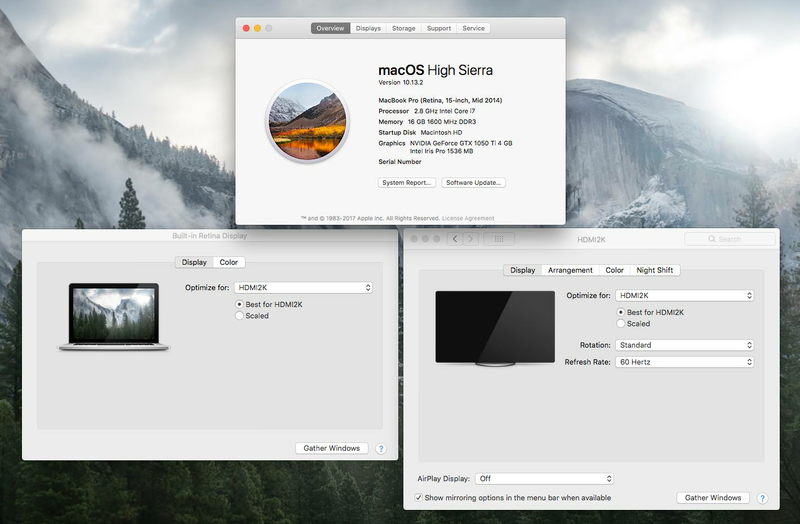 If Mac OSX booted without the eGPU, repeat steps 1-3. 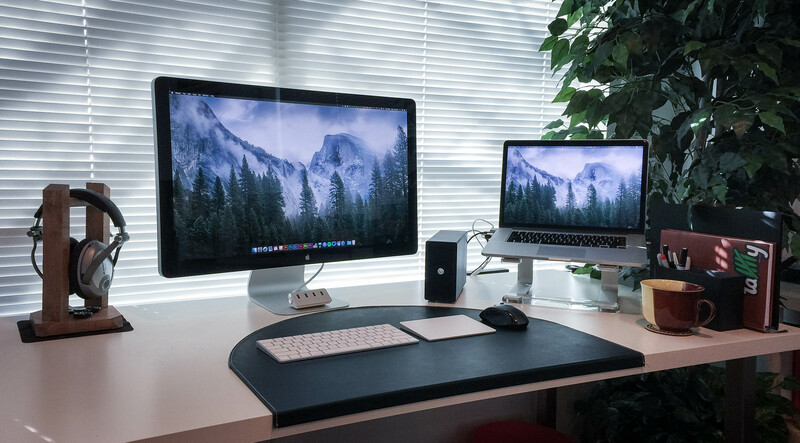 Both OSX and Windows required the use of an HDMI Monitor Emulator (Link above) to work without adding/modding an EFI or adding any complicated steps. On both platforms I just had to set the "fake monitor" as the main display. If an apps opens on the fake display, just use your shortcut you just created to move the app over to the internal screen. All of the above setup at 1080p with "high" settings which yields between 30 & 60 frames. Issue with internal screen not waking up from sleep in both OSX and Windows. Only workaround so far is to manually shutdown the MBP and reboot. Inconsistent and unreliable way to get eGPU to boot with Windows. Usually takes 2-3 reboots to work. Akitio sent me a new LED and fan. The new LED is working great. Update: Added an NB Black Silent fan to the mix. 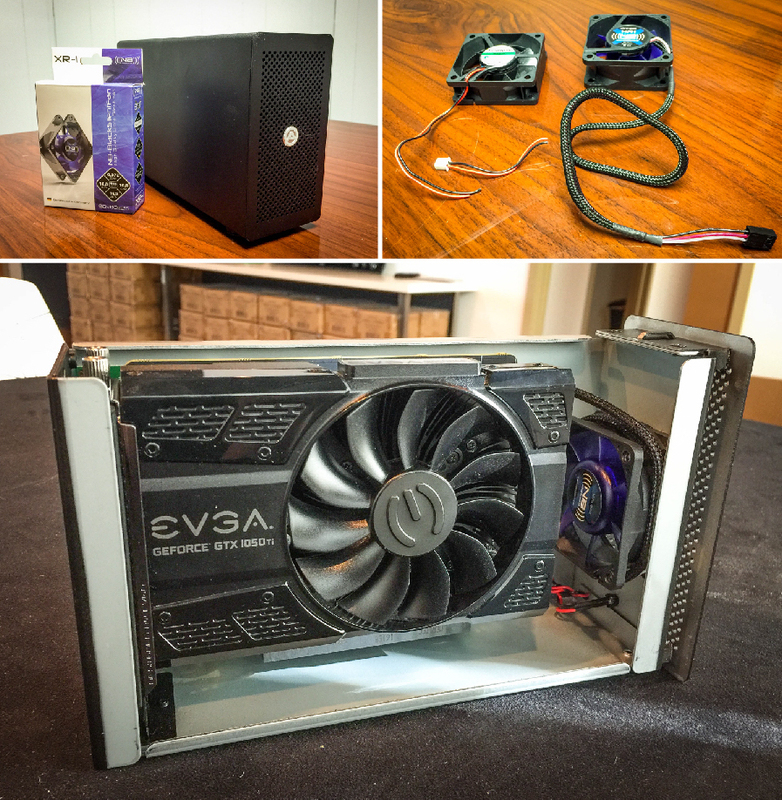 It's much quieter than the stock fan although 5mm wider—a small price to pay if you ask me. I used just the black and red wires from the new fan and soldered on the connector from the stock fan onto the NB. I also mounted it in reverse, pulling air out of the enclosure instead of in. 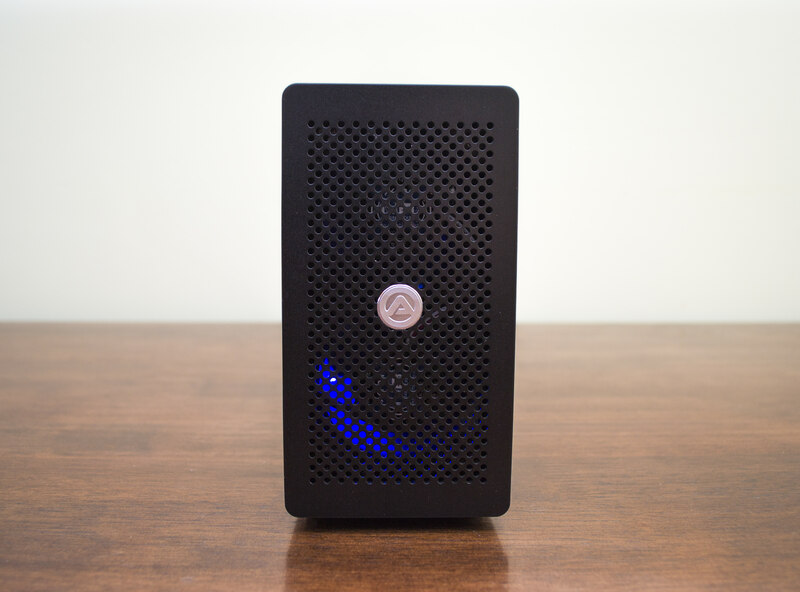 I'm no cooling expert but have a hunch this will be better for airflow. I will do some temp testing and see if it had any effect on the temps inside the box with the GPU at load and report back with my findings. For now, I'm enjoying the quieter fan. Awesome. Do you have links to the products you purchased? Thanks! I have the same model Macbook and I look forward to trying this out. Thank you for posting what has worked for you. Here are the results of my tests in fahrenheit. All taken in the same cold basement, the case closed, running the same software for the same amount of time. Looks like a few degrees is the cost for a quieter fan. I'm ok with that but assuming if I put the card in a warmer environment, the temp difference would be higher. So, I will have to monitor that and see what happens. Although I don't see this as a problem, maybe a Noctua fan would be a better investment? People seem to swear by them. In the meantime, I will be switching the fan's direction back to blowing in as it seems to work ever so gently better. I also noticed that the front LED no longer works. So, I will also have to figure that out as well. Fun. New day, new issue. Looks like when booted into OSX with the eGPU, the internal screen will not wake up from sleep. Anyone know a fix while I look for one? 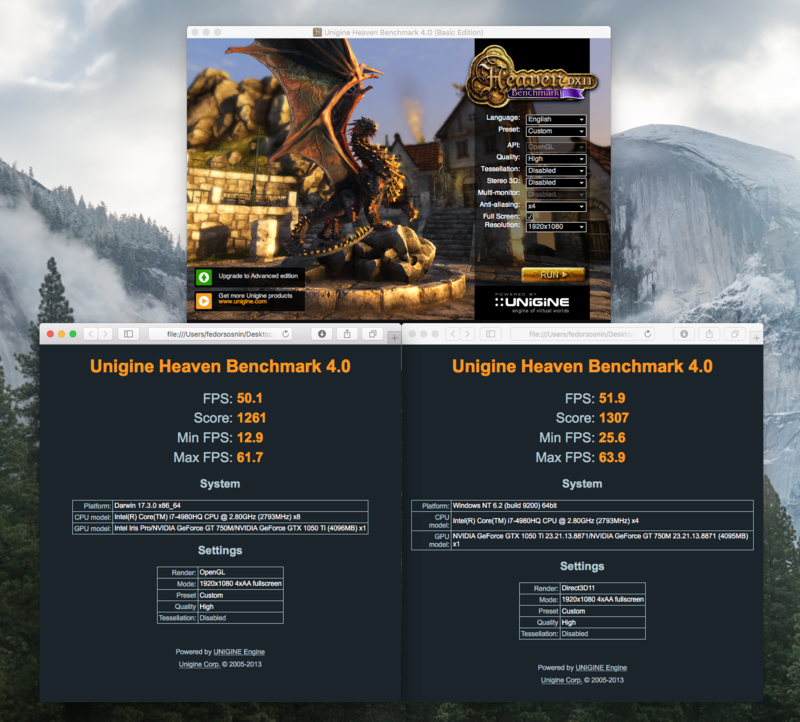 Here's the results from the Uningine Heaven Benchmark. 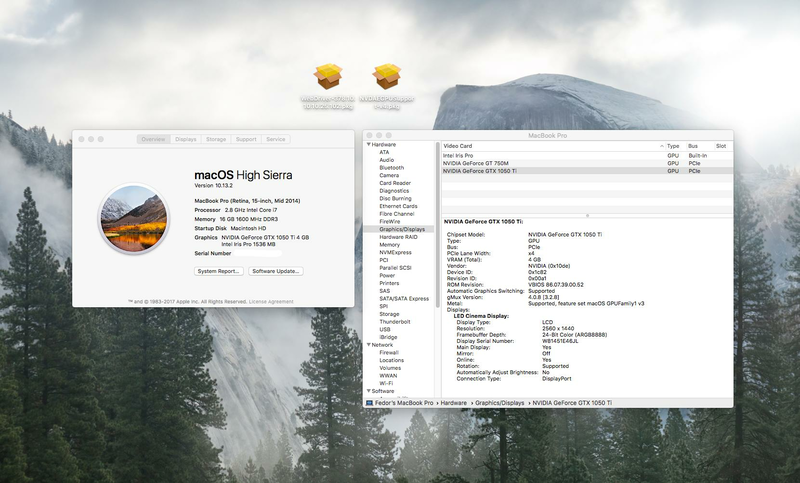 High settings in 1080p in MacOSX (Left) vs. Windows 10 (Right). Really interested for your implemetation! Is it possible to check if premiere pro and davinci are using egpu (cuda) in macOS? No problem! I do not own Davinci but Premiere Pro is working with the eGPU along with all other apps that use a GPU such as the Adobe Suite in OSX. In other news, I'm going to be trying to get the internal screen to work with the eGPU in Windows 10. No luck so far but I'm learning. Does it work using either internal and external screen (macos) ? I can confirm it works in OSX on the internal screen. However, I was only able to get it working with a headless hdmi adapter (I will add a link above) and making the "fake display" the main one. You can get any apps that open on the "fake monitor" to your screen by right clicking the icon > option > assign to > display 2. I know there are some easy how-to's floating around to get it working nice and smooth with out many steps, but I just wanted to quickly confirm that it works. So yes, it works with both an external and the internal displays. Noise level is still about 50% quieter than the stock single fan. Only thing not pictured is an HDMI cable I forgot inside one of the zip pockets. This is perfect for what I need! I bring this bag with me to work, plug in my eGPU and laptop, and I'm all set at the office with my Apple Cinema Display I have on my desk. 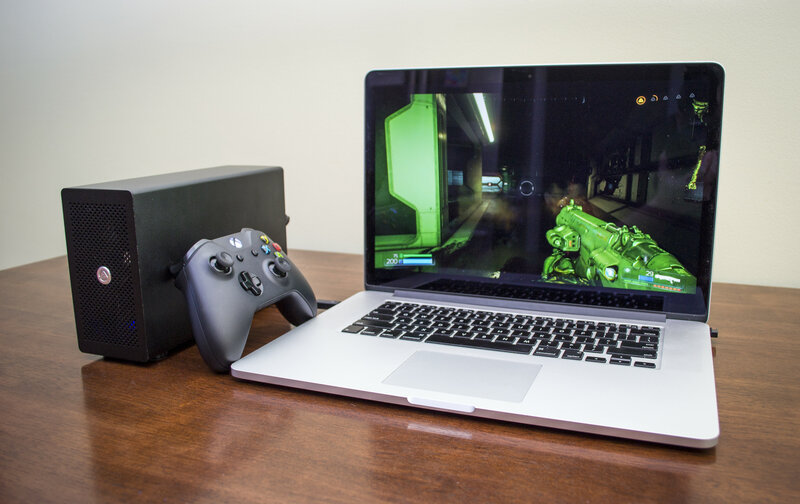 Then, I bring it all home and after the wife and kid are in bed I boot into Windows and I can get a game in on the same machine with just two extra cables; the eGPU power adapter and thunder2 cable. I can even use the HDMI cable to plug right into my tv, sit back on the couch with my xbox controller and play some Forza. If I had more funds I'd spring for a 1070 but I absolutely adore this setup with the 1050ti and the tiny Akitio thunder2. It really makes this "old" laptop extremely versatile! Anyone have issues with black lock screen in windows before? On boot, I can see the mouse and a black screen. If I type in my pass and hit enter I can get past it. Seems to have happened randomly today and I can't seem to find a fix. Thanks for the reports. I had a thunder3 with the same MBP as yours. It worked until High Sierra, sold the thunder3. Considering to get a thunder2. Do you think it will work with an AMD card? I'm all into FCPX, which benefits from AMD cards. I would love to get an eGPU again to get anything going again on this slow FCPX machine. Ok found what the issue is. This happens when you shutdown windows with your internal screen setup still in extended monitor mode with your hdmi "fake display" in. The lockscreen is black because it would be showing on the other display. That is why you can still get in when typing your pass. Just be sure to set your screens to mirrored before shutting down windows. I followed your steps with my 2016 15'' MacBook Pro +RP460+AORUS Gaming BOX 1070 in Mac OS 10.13.2. Mac OS identify the Nvdia Web Driver ，my 1070 Successfully. And I also bought the same HDMI Display Emulator. Then, I plug the HDMI Display Emulator into the AGB，and set the “fake monitor” as the main display, it still works fine. Glad you got things running. Even with a different Mac and different enclosure. Nice. Maybe this is a setting within Finder? Maybe try Control + Right Click and see if you get the "Options" menu. A quick Google search shows a few people with this option missing but I didn't see a fix. More research is needed I think. I also have not had any issues with the screen turning black but at least you know that it is not the Display Emulator causing that issue. At least we can rule that out. I'm assuming you have rebooted the system? I figured I'd roll the dice and update. Big mistake. I was no longer able to boot. Mac OSX was stuck on the boot load screen. Even after clearing the rams I was still stick. Basically, I was forced to use recovery mode and had to restore from a backup. Luckily the new Samsung T5 SSD is super fast! After the restore, even though the drivers where still installed, I was forced to follow my steps above and reinstall both the NVDA drivers and the EGPU pkg. Now I'm back to normal. Guess updating isn't really an option a the moment if you want to seamlessly continue using the eGPU. Im going to assume, because that update does NOT change the version of the OS there is still a way to get things running, but I have not found it yet. I'm going to try again but with the stock Apple video drivers enabled before the install. out after reinstalling the mac osx several times when always ending up at the stucked boot process. if that happens the easiest way is not to do a new install. it is just to start the macbook pro to target disk mode with pressing "t" at Startup and then connect to another Computer via thunderbolt or a firewire Adapter Access the harddrive and then to delete the NVIDIAEGPU.kext file that is in the System Folder"extensions". there s also a terminal command for that which you can use in recovery mode. 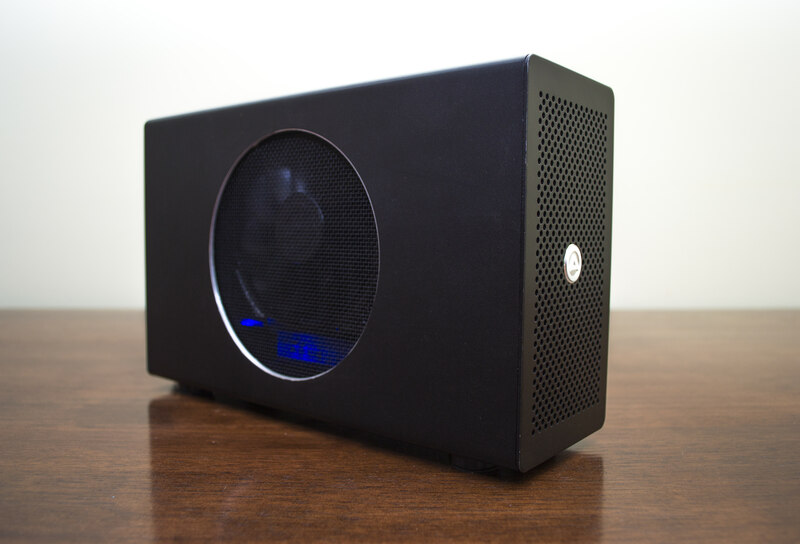 my first build was based on a mac mini 2014 a node and an nvidia 1080ti. that was super easy to set up and it runs super stable. no boot tricks required in Windows 10. since i am trying to get this to work on a MBP 2014 with the 750m, a node and a 1080ti it's pure Frustration. although with an AMD Card that process is super easy too. I don't understand why the nvidia dgpu and egpu Setup is so difficult. When I ran into this issue previously, I had no success deleting all NVIDIA files via terminal in recovery. So this time, I didn't even try it. Maybe, I should have. Thanks for the tip. I'm still looking for a black screen/grill to add. In the mean time, the temps are staying super low in — around 45°C when gaming. I'll add more photos and info to the top of the page soon. 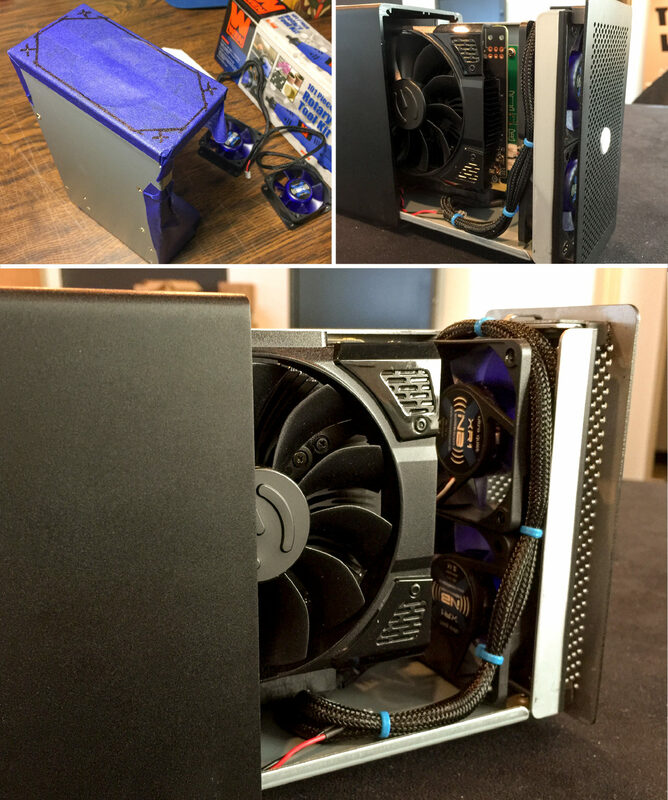 Added updated info to the original post as well as the latest photos of my case mod and my ultra portable gaming setup! It is your sale, so you're of course free to ask for whatever price you like, but selling a used card for more than a new one costs rubs me the wrong way. I based the price on how much they are selling for on eBay right now. Looks like they are going for $280-$300 new and this was used for less than two months. So $260 OBO including shipping sounded reasonable to me. If it sells, great. If it doesn't, I will surely lower it. Hmm. Which enclosure are you using and which OS are you running? It is your sale, so you’re of course free to ask for whatever price you like, but selling a used card for more than a new one costs rubs me the wrong way.